lower right, WM in monogram: WM.M.Chase. (Chase sale, American Art Galleries, New York, 7 January 1896, no. 1169); Louis Ettlinger [1845-1927], New York. Paul Mellon [1907-1999], Upperville, Virginia; bequest 1999 to NGA, with life interest to Mrs. Mellon; life interest released 2012. National Academy of Design Thirteenth Annual Exhibition, New York, 10 December 1894-5 January 1895, no. 222. Exhibition of American Paintings from the Collection of Louis Ettlinger, Esq., Lotos Club, New York, 1906, no. 9. 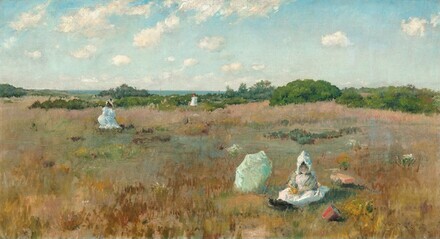 William Merritt Chase: Summers at Shinnecock 1891-1902, National Gallery of Art, Washington, D.C., Terra Museum of American Art, Chicago, 1987-1988, no. 8, repro. "The National Academy of Design." Art Amateur (January 1895): 43. Pisano, Ronald G. Summer Afternoons: Landscape Paintings of William Merritt Chase. Boston, 1993: 101, repro. Pisano, Ronald G. The Complete Catalogue of Known and Documented Work by William Merritt Chase (1849-1916), vol. 3. New Haven, Connecticut: Yale University Press, 2009, p. 98, no. L.94. Baker, D. Frederick. "A Painted Diary: The Landscapes of William Merritt Chase." Antiques & Fine Arts (Summer 2009): 121-122, repro. Kelly, Franklin. "A Lasting Legacy: The Completion of an Unparalleled Gift." National Gallery of Art Bulletin no. 51 (Fall 2014): 8, repro.